With the blessing of the Synod of Bishops of the Russian Orthodox Church Abroad, Bishop Michael of Geneva and Western Europe travelled to Haiti from 11/26 - 11/30, 2007. The purpose of this trip was to strengthen and encourage the faithful clergy and members of the Haitian Mission of the Russian Church Abroad. On Tuesday, Bishop Michael met with Fr. Jean-Chenier Dumais and Fr. Gregoire Legouté in Port-au-Prince and spoke at length concerning the Mission's development and needs. On Wednesday, 11/28, Bishop Michael, Fr. Jean, Fr. 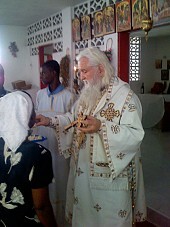 Gregoire, and Deacon Matthew Williams travelled to Jacmel, on the southern coast of Haiti, where Bp. Michael met with members of the parish of St. Augustine (there is, at present, no priest residing in Jacmel). After returning to Port-au-Prince, Vigil was served on Wednesday evening and Hierarchical Liturgy on Thursday morning for the Apostle Matthew.